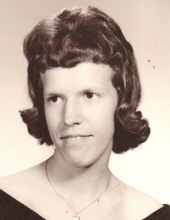 71 year old Geff, Illinois resident Nancy Paul passed away Tuesday, March 12, 2019 at her residence. She had been a cashier at IGA in Fairfield for several years. Nancy was born July 23, 1947 in Fairfield, Illinois to Joe & Louella (Owen) Carter. Nancy married Carl Paul on October 4, 1973 in Cisne, Illinois and he preceded her in death on August 24, 2012. Nancy is survived by one son, William Paul of Geff, Illinois and two brothers, Joe Sloan and his wife Maria of Seymour, Texas and Harvey Michels of Evansville, Indiana. She was preceded in death by her husband, parents, one brother and one sister. Graveside services for Nancy Paul will be 3:00 p.m. Friday, March 15, 2019 at Ebenezer Cemetery. Memorials may be made to Nale's Funeral Home to help with funeral expenses and will be accepted at Nale's Funeral Home in Fairfield.